Al Ahly have put on foot in the CAF Champions League quarter-finals following a 5-0 victory over Tanzanian side Simba at Borg El-Arab. The Cairo giants entered the game sitting top of group D with four points from two games, while Simba came in third with three points from the same number of games. It didn’t take the hosts much to open the scoreline, as after three minutes only, Amr El-Sulya put Al Ahly into the lead, converting Hussein El-Shaht’s cross. Al Ahly continued to dominate the game and had to chances to double the lead through Maaloul and Ajayi, but they couldn’t find the net. In the 23rd minute, Ali Maaloul finished off a great teamwork move, which was started by Nasser Maher, to double the Reds’ lead. Eight minutes later, Junior Ajayi made it 3-0 putting Ali Maaloul’s low cross into the net with a great touch. Record signing El-Shahat put Nedved through on goal with a brilliant pass, and the youngster managed to make it 5-0, five minutes before the end of the first-half. The second-half started slow and Al Ahly looked like they wanted to maintain the scoreline, which led to Lasarte giving Mahmoud Wahid his Al Ahly debut, bringing him on for Ali Maaloul in the 59th minute. The Reds continued their dominance, but without creating any clear-cut chances, with the most dangerous chance coming from El-Shahat, whose shot went over the crossbar. 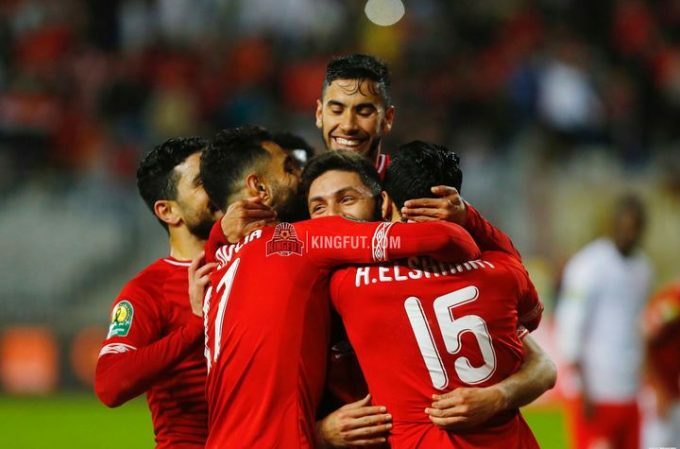 Team captain Hossam Ashour replaced Mohamed Hany in the 70th minute, and the game also saw the return of Rami Rabia, who played his first game in over a year, when he replaced Ayman Ashraf seven minutes later. The final minute didn’t witness any action, as Al Ahly managed to secure a big win, which kept them top of the group with seven points, three more than AS Vita Club, and four ahead of Simba SC.